Once part of the Rabot Estate, one of Soufrière’s oldest and most famous cocoa plantations, Ladera Resort stands today as St. Lucia’s most unique and luxurious resort, and the only resort situated on a UNESCO World Heritage site. The setting is breathtaking and unlike any other, on a volcano ridgeline 1,000 feet above the deep, blue Caribbean Sea, with stunning views of the Pitons. 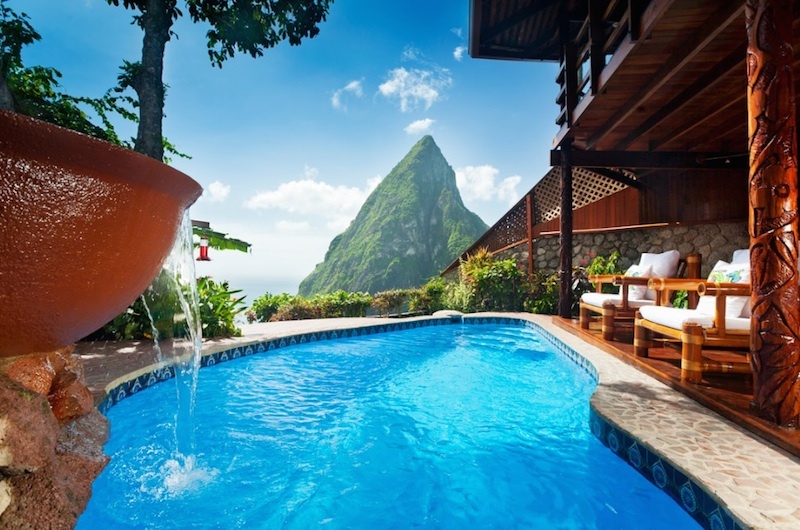 Green Globe recently awarded Ladera Resort its first certification. Mr Gandara is a leading figure at the resort, committed to the conservation of wildlife and resources in the Soufrière region. Several strategies have been established at the property to reduce electricity consumption. There has been an increased use of LED light bulbs and new procedures have been implemented whereby all lights, water pumps, electrical water heaters and other electrical equipment are checked on a regular basis to ensure they are turned on only when necessary. In addition, where possible water heaters have been replaced with solar water heaters. To date, on comparison of room nights to room night occupancy and usage, electricity bills have fallen by 10%. Ladera Resort has been successful in significantly reducing the quantity of plastic drink bottles that were previously used by staff and guests. Plastic soda bottles have been replaced with reusable glass bottles and the resort has now partnered with a company that sells paper water bottles with caps and lids produced from biodegradable sugar cane. The resort’s Green Team was instrumental in devising a plastic bottle eradication strategy and now 1.5 liter water bottles are the only plastic bottles available. The property is working with suppliers to eventually replace these bottles with sustainable containers. “By implementing all these steps, we have been able to offer a better product, create less plastic garbage and save money. We are very proud to announce that in the first 8 months of implementation, we saved over 55, 000 plastic bottles from being thrown away,” added Mr Gandara. What is the safest city in the world? Hawaii hotel occupancy vs. timeshares: Who wins? How Expedia got Hawaii Tourism Authority president and CEO George Szigeti fired? List of the busiest air routes in the world: Jeju-Seoul, Melbourne-Sydney, Sapporo-Tokyo and…..